2 Heat oil in a medium pan and cook onions until golden. Add milk and water, bring to the boil. Add Pasta & Sauce and simmer uncovered for 8 minutes, stirring occasionally. Stir in spinach, peas and tuna; mix well. 3 Place mix into a lightly greased ovenproof dish. Sprinkle with cheese and bake for 20 minutes or until golden. 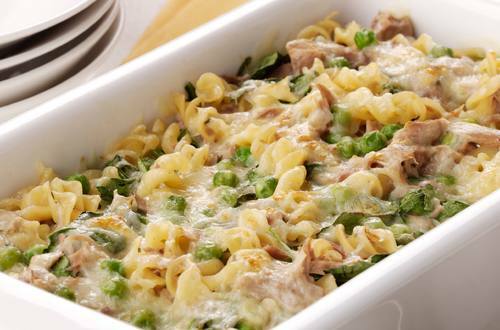 4 This easy pasta bake is great with white wine after a lone tiring day.